– from the main railway station of Verona Porta Nuova, take a local train to Villafranca di Verona. The journey will take about 16 minutes. Inform us about your arrival previously with an e-mail and once you are there we provide a pick up service (with a small fee). – take a bus from the square opposite the main railway station (usually platform 18) to Povegliano and get off at the main square in front of the church/municipal office. Ask us about the bus timetable, and once you are there we provide a pick up service (with a small fee). – Take a taxi (taxis are located outside the terminal). – Ask for the Campus Taxi Service, the service is available from 10am until 7pm. Inform us about your arrival at least 2 days before your arrival with an e-mail and once you are there we provide a pick up service (with a small fee). Milan has 2 international airports, Malpensa and Linate. – from the main railway station take a local train to Villafranca di Verona. The journey will take about 16 minutes. Inform us about your arrival previously with an e-mail and once you are there we provide a pick up service (with a small fee). – take a local train to Villafranca di Verona. The journey will take about 16 minutes. Inform us about your arrival previously with an e-mail and once you are there we provide a pick up service (with a small fee). – On the highway A4 Milano-Venezia before reaching Verona follow the direction for the highway A22 towards Modena. Get out at Nogarole Rocca tollgate. At the roundabout, follow the direction to Povegliano. After 6 km, and 2 km before reaching Povegliano town center you find a road on the right, Via Ronchi. Follow the road untill you can see the sign The Campus. 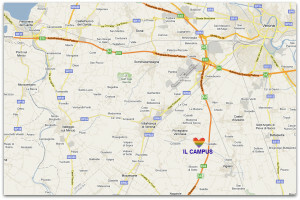 – On the highway A4 Venezia-Milano, after passing Verona Sud, follow the direction to the highway A22 towards Modena. Get out at Nogarole Rocca tollgate. At the roundabout follow the direction to Povegliano. After 6 km, and 2 km before reaching Povegliano town center you will find a road on the right, Via Ronchi. Follow the road until you can see the sign The Campus. 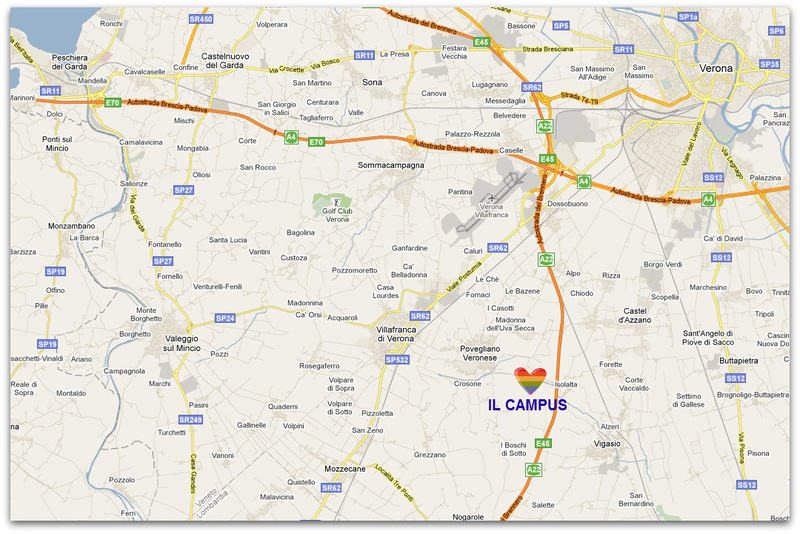 – on the highway A22 Modena-Brennero, follow the direction for Modena, get out at Nogarole Rocca tollgate. At the roundabout follow the direction to Povegliano. After 6 km, and 2 km before reaching Povegliano town center you find a road on the right, Via Ronchi. Follow the road until you can see the sign The Campus. 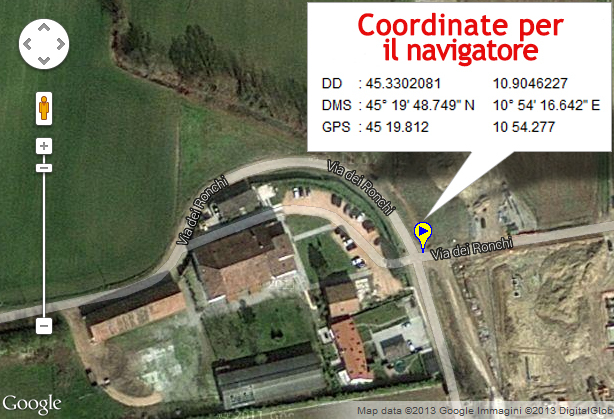 – on the highway A22 Modena-Brennero, follow the direction for Brennero, get out at Nogarole Rocca tollgate. At the roundabout follow the direction to Povegliano. Some gps devices cannot easily find our address (Via dei Ronchi 40, Povegliano Veronese, Italy), so you can use the coordinate system.